Enjoy the urban wine boom on a bike. Now you can taste and learn by the glass. Drink wine poured by the vintner. The way they used to in Napa. 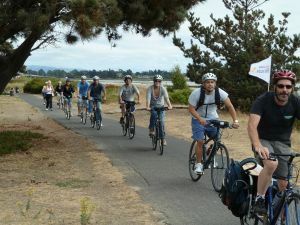 Easy bike tours of 'wine city', the local alternative to wine country. It’s always the right time to book a tour. Sure, it does occasionally rain here, mostly in the winter. 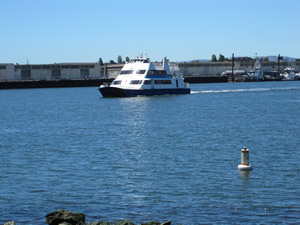 Our rides start a short distance from the Ferry Terminal gate in Jack London Square near downtown Oakland. You can take the ferry from the Embarcadero or Pier 41 in San Francisco. We are also close to downtown Oakland BART and bus stops where shuttles are available. Most tours start around 11:30AM. If you get here a little early, you can enjoy the sights at Jack London Square. Convenient parking is also available. Here's the news: the hottest new wineries are now in the East Bay. From the San Francisco Chronicle's June 20, 2010 front page: "The city vintners have more than doubled in number in the past few years, as fledgling winemakers wised up to facts about the East Bay that a handful of pioneers have known since the late 1970s: It's an hour from the best grapes in the United States, space is cheap, infrastructure is solid, and there is an endless supply of people who like wine." 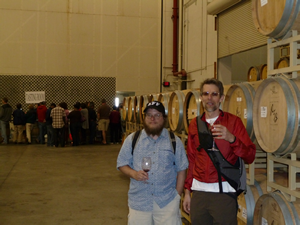 Click here to meet the winemakers! At EBWBT, our mission is to lead you to beautiful wine while enjoying a nice, easy bike ride on flat, safe routes. We love wine, as much as we love to explore cities, in the special ways that only a bike can let you do. A mix of gritty and pretty: a short ride through an urban but safe stretch, then a longer one alongside a lovely beach. Later, the ride takes us to an area rich in history, with a gorgeous view and great wineries. 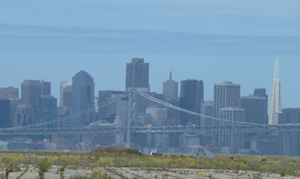 No, this is not your standard skyline view of San Francisco. This is the view from a winery in a remote corner of Alameda that used be a Naval Air Station only a few short miles - as the crow flies - across the bay from San Francisco. People usually associate winemaking with the vineyards of Napa, but in fact wines were being made right here before the process moved up north in the 60s and 70s.